Location of Mundelein in Lake County, Illinois. 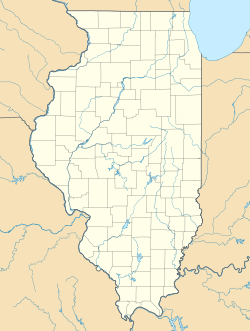 Mundelein is a village in Lake County, Illinois, United States and a northern suburb of Chicago. As of the 2010 census, the village population was 31,064. It is approximately thirty-five miles northwest of Chicago. The community now known as Mundelein has been inhabited since at least 1650, when the Potawatomi people were known to have been trading with French fur traders. The first European inhabitants reached the area in the early 19th century. Peter Shaddle (for whom a street is named) was the first known settler, building a log cabin in the area now owned by St. Mary of the Lake Seminary in 1835. The next settlers were tradesmen escaping from England's industrial depression, who became farmers in the Mundelein area. In honor of their former professions, they named the city "Mechanics Grove", and built schools, churches, and businesses. The community grew and (while still unincorporated) changed its name to "Holcomb", in honor of John Holcomb, a person who was active in the area's development. As Holcomb, the community added a railway station and a post office. The Holcomb area incorporated in February 1909 under a new name, "Rockefeller", a reference to businessman, John D. Rockefeller. The name Rockefeller was short lived, however. In July 1909, the community became "Area". This name change was requested by a local educational entrepreneur named Arthur Sheldon, who bought 600 acres (2.4 km2) near town and built a school on it. The school taught sales techniques, including the philosophy of "AREA", which stood for "Ability, Reliability, Endurance, and Action." At one time, it boasted 10,000 students, many of them women (which was unusual for 1909). In 1915, Archbishop George Mundelein (later Cardinal) of Chicago purchased the property from Sheldon after the Area campus closed to re-establish the Archdiocese's University of Saint Mary of the Lake, also known as the Mundelein Seminary, which continues to exist today. On December 10, 1924, the Village Board held a special meeting with representatives from the Soo Line Railroad, who requested that the board change the village's name to Mundelein (for the cardinal). The board voted to make the change and asked the Illinois Secretary of State to make the name change. They received permission in April 1925, and the Village Board passed an ordinance changing the village's name to Mundelein. Cardinal Mundelein donated the village its first new fire truck, a 1925 Stoughton. The fire truck was officially turned over to the village at a ceremony held at the St. Mary of the Lake Seminary on July 17, 1925. The original Village Hall, built in 1929 with a few additions over the years, was used until June 2014. In the 1970s the community was largely residential with a little light industrial development. Mundelein is located at 42°15'47.0"N 88°00'14.4"W (42.263049, -88.004010). According to the 2010 census, Mundelein has a total area of 9.969 square miles (25.82 km2), of which 9.57 square miles (24.79 km2) (or 96%) is land and 0.399 square miles (1.03 km2) (or 4%) is water. As of the 2000 census, there were 30,935 people, 9,858 households, and 7,718 families residing in the village. The population density was 3,587.5 people per square mile (1,385.6/km²). There were 10,167 housing units at an average density of 1,179.0 per square mile (455.4/km²). The racial makeup of the village was 78.68% White, 1.60% Black, 0.28% Native American, 6.60% Asian, 0.07% Pacific Islander, 10.66% from other races, and 2.11% from two or more races. Hispanic or Latino of any race were 51.09% of the population. There were 9,858 households out of which 47.2% had children under the age of 18 living with them, 65.0% were married couples living together, 9.0% had a female householder with no husband present, and 21.7% were non-families. 17.0% of all households were made up of individuals and 4.5% had someone living alone who was 65 years of age or older. The average household size was 3.12 and the average family size was 3.52. In the village, the population was spread out with 31.4% under the age of 18, 8.3% from 18 to 24, 36.0% from 25 to 44, 18.1% from 45 to 64, and 6.2% who were 65 years of age or older. The median age was 32 years. For every 100 females, there were 104.6 males. For every 100 females age 18 and over, there were 103.6 males. The median income for a household in the village was $69,651, and the median income for a family was $75,083. (By 2017, median incomes were estimated at $86,336 per household and $96,813 per family.) Males had a median income of $50,290 versus $34,087 for females. The per capita income for the village was $26,280. About 3.0% of families and 4.6% of the population were below the poverty line, including 5.2% of those under age 18 and 3.4% of those age 65 or over. As of the 2010 US Census, there were 31,064 people residing in the village. The racial makeup of the village was 72.29% White, 1.52% African American, 0.65% Native American, 8.77% Asian, 0.03% Pacific Islander, 14.18% from other races, and 2.56% from two or more races. Hispanic or Latino of any race were 30.08% of the population. Mundelein has a station on Metra's North Central Service, which provides weekday rail service between Antioch and Chicago Union Station. A small private airport, Air Estates Airport, is located northwest of Mundelein. ^ "Geographic Identifiers: 2010 Demographic Profile Data (G001): Mundelein village, Illinois". U.S. Census Bureau, American Factfinder. Retrieved December 18, 2012. ^ "Life of Peter Shaddle". Leaneagh Family History. Archived from the original on 27 January 2013. Retrieved 12 November 2012. ^ a b "Arthur Sheldon, 'Philosopher of Selling,' is dead". Chicago Tribune. 22 December 1935. Retrieved 18 September 2016. ^ "American FactFinder S1901 - INCOME IN THE PAST 12 MONTHS (IN 2017 INFLATION-ADJUSTED DOLLARS)". United States Census Bureau. Retrieved 2019-04-05. ^ "Village of Mundelein Comprehensive Annual Financial Report Year Ended April 30, 2017" (PDF). Village of Mundelein | Illinois Local Government Organization. 30 October 2017. Retrieved 9 June 2018. This list is incomplete. Students in Arlington Heights may be assigned to other schools outside of the city limits.